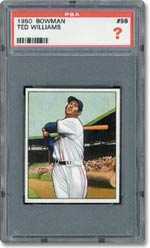 For sports card collectors, the "World Series" won't start in October. It will be held in July, and offer the eventual champion a year of bragging rights and a $2,500 cash prize. Professional Sports Authenticator (PSA) will conduct the PSA World Series of Sports Card Grading©, a test of knowledge and skill about grading cards. Competition will be held at the PSA booth at National Sports Collectors Convention in Cleveland, Ohio, Thursday - Sunday, July 22 - 25, 2004. "This is a winner-take-all competition to determine the top card grader at The National. The winner will receive $2,500 cash," said Joe Orlando, PSA President. "Here's your chance to put your grading skills to the test and go up against the best among collectors and dealers. Who will be the top sports card grader? We'll find out." Each contestant will have 15 minutes to examine 30 cards and determine their grades. The cards will be previously graded and encapsulated by PSA, and selected from the marketplace by Orlando and the grading staff. The test will cover cards from different eras and will range from pre-war era to modern issues. The contestants will be scored on how many times their grades match those previously determined by PSA. In the event of a tie, there will be a tie-breaking round. In the event that a contestant's grade does not match PSA's, the distance between the correct answer and the one entered by the contestant will count. For example, if the correct answer is, "Mint 9," but the contestant enters "Near Mint 7," a deduction of 2 points will be applied. In addition, altered cards may be included on the test. An automatic deduction of 5 points will be applied if a contestant enters any grade for an altered card. "Please keep in mind that the rules may change before the contest takes place. Check the PSA web site, psacard.com, for updates along the way," said Orlando. Every contestant will receive a T-shirt commemorating the PSA World Series of Sports Card Grading. The competition is open to anyone except current PSA employees. There is a $50 entry fee, and entrants must make a reservation to take the test at the National Sports Collectors Convention. Reservations will be accepted starting June 1, 2004 by contacting Evelyn Carrillo at PSA. For additional information or to sign up for the PSA World Series Sports Card Grading, call PSA at (800) 325-1121. Details about the competition are available online at www.PSAcard.com.